Welcome to one of Jacksonville's most prestigious gated communities, beautiful & desirable Jacksonville Golf and Country Club. This waterfront home boasts elegant features and upgrades throughout. 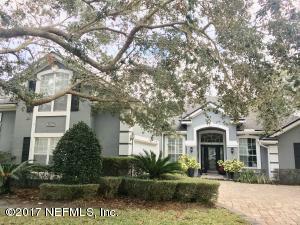 As you pull into the drive, with a courtyard-entry garage, you will be captivated by the beautiful moss covered oak trees and greeted by the splendor of this exquisite home. It is the perfect setting for entertaining...from large celebrations, summer parties by the crystal blue pool, or intimate moments with family. Plentiful living space offers separate formal living & dining rooms, office with built-in work space (could be 5th bedrm), eat-in kitchen with breakfast bar that overlooks family room w/fireplace. Upstairs bonus room with full bath. Fully screened pool and patio. Cul de sac location. This home has been on the market since Dec 30,2017. Courtesy of KELLER WILLIAMS REALTY ATLANTIC PARTNERS SOUTHSIDE.